Maybe you have heard about the Caucasus Mountains, or maybe you haven’t. It’s a mountain system that borders the continents of Europe and Asia, with majestic peaks, lakes and forest areas. This mountain range also lies between the Black Sea and Caspian Sea, and is home to some of Europe’s tallest mountains. If you’re wondering why the word “Caucasus” sounds so familiar, perhaps you’re thinking about Caucasians. And no, the Caucasian race did not originate from the Caucasus Mountains. This is a misconception that will be explained in this list of top things that you didn’t know about people of Caucasus. 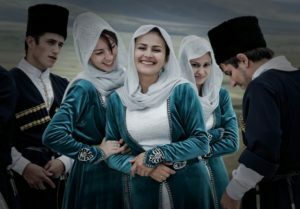 Before you read about the people of Caucasus, however, it’s a good idea to first learn about these Things Worth to Know About Caucasus Mountains. Once you’ve gained basic understanding of this mountain range, you can find out about the top things that you didn’t know about people of Caucasus! 1. Who Lives in the Caucasus Mountains? The Caucasus population is made up of over 50 peoples, and can generally be divided into five cultural categories. The western side accommodates Georgians who mostly embraces Orthodox Christians, while Armenians populate the south central area. The latter also develops and follows a different branch of Christianity unique to their people. The third group is actually the Shiite Muslims Azerbaijanis who fills up the entire eastern side of the Caucasus. Meanwhile, the Dagesta region is home to 50 different groups, most of whom are Muslim. If you want to find out more about how Islam fares in the Russian community, check out the History of Muslim Culture in Russia. Finally, the mountains’ northern side is made up of different smaller groups like the Avars, Circassians and Chechens. There are dozens of different languages spoken all throughout this mountain region, but all can be categorized into 3 major groups: Indo-European, Caucasian and Altaic. For example, there are 6 variations of Turkic languages, 8 different Georgian dialects and 30 languages in the Dagesta area alone. Furthermore, four-fifth of the entire people of the Caucasus are either Russian or Ukrainian. A lot of these people speak Russian, so this might be why the language becomes a widely accepted medium of Caucasus communication. You are already aware to the numerous different groups of Caucasus men. But where exactly do they live? How are their houses arranged? Well, these various groups are spread out in seemingly random spots throughout the valleys, lowlands and mountains. In some occasions, one ethnic group would reside in just a single valley, while other groups occupy a cluster of valleys. Therefore, most people in the Caucasus live and huddle together with their own ethnic groups. Of course, this is not to say that the people of Caucasus are the only ones who love their families. We all do, do we not? But it is known that these people of the Caucasus value loyalty to their own families and clans more than anything else. This mindset has been passed down from generation to generation. Traditionally, family loyalties have even been said to be of higher importance than loyalty towards their region or ethnic group. Many of us have been led to believe that the Caucasians are from the Caucasus, but this is actually not true. At least, there has been no historical evidence to back up this claim. Today, the term “Caucasian” is often used to refer to white people of the European ancestry. But do you know who had first created this term? Johann Friedrich was a German anatomist who believed that the Caucasus Mountains bred highly attractive people. This simple belief led him to assume that white Europeans had indeed originated from the Caucasus. Another story says that a female skull was found near these mountain areas, and that the founder thought it was the most beautiful skull he’d ever seen. He also saw that the skull was a pristine white and claimed that this was the natural color of mankind. It was evolution which had darkened the skin of some men. Well, believe it or not, the Caucasian race received its name from such a prejudiced generalization of ethnic groups, many centuries ago. These are just a handful of top things that you didn’t know about people of Caucasus. Hopefully, upon reading this, you have gained a deeper understanding about the men of this magnificent landscape. If you ever get the chance to visit the Caucasus Mountains, make sure you do! Especially now that you are more well-acquainted with its culture and history. As you plan your trip to this beautiful mountain range, you might as well add in a couple of days to your itinerary to explore Russia. Find out when is the Best Time to Visit Russia and make the most of your vacation. Don’t forget to master the basic phrases of the Russian language by learning the most Common Greetings in Russian. Finally, you have to know this essential Etiquette in Russia That You Need to Know, so that you won’t make any social blunders.